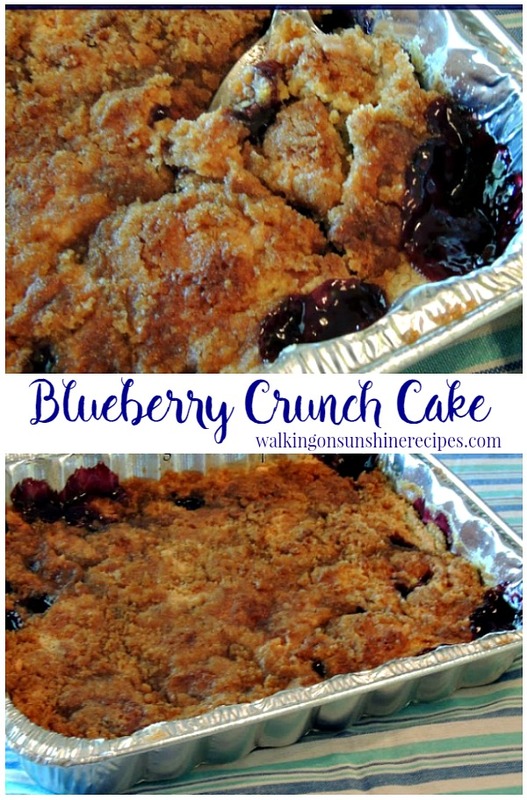 Blueberry Crunch Cake or Blueberry Dump Cake is so easy you’ll be making this recipe over and over again! Serve it warm from the oven with a scoop of vanilla ice cream or homemade whipped cream. Your family is going to love it! If you’re looking for an easy recipe, then this recipe is for you! Our church holds an outreach to feed people in need every Monday. We have a wonderful couple in charge of this ministry that not only feeds physical bodies but also feeds their spirits. 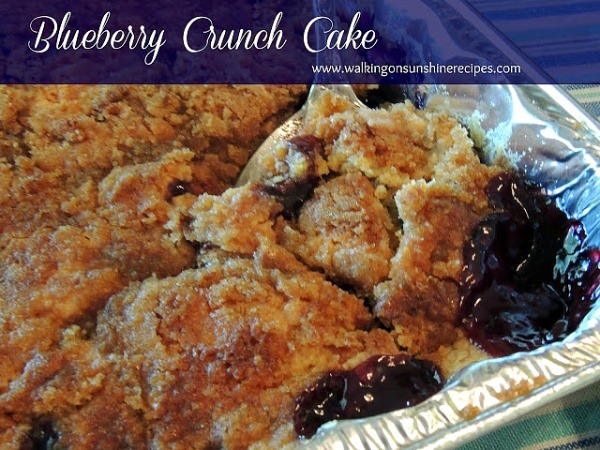 Every Monday morning I bake a dessert to bring over to the church for the meal.Last Monday I baked Blueberry Crunch Cake which is a twist on one of the most popular recipes on our blog, Peach Crunch Cake. Both cakes start out with a cake mix making things really easy. This was an easy cake to prepare and although, I didn’t get to taste a whole piece, I was able to sneak in a little bite when I removed the spoon after taking the above photo. It was delicious. I love blueberries and this cake was perfect. 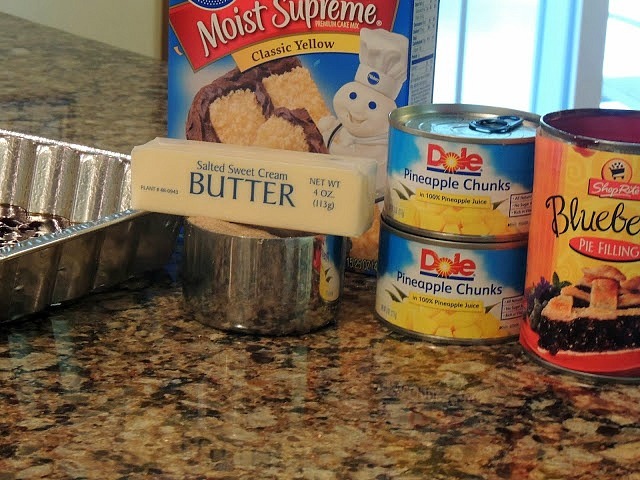 Here’s all you need to make this easy recipe…blueberry pie filling, pineapple chunks, butter, brown sugar and a boxed cake mix. All you need to complete this recipe is a spoonful of vanilla ice cream or homemade whipped cream. Yummy! 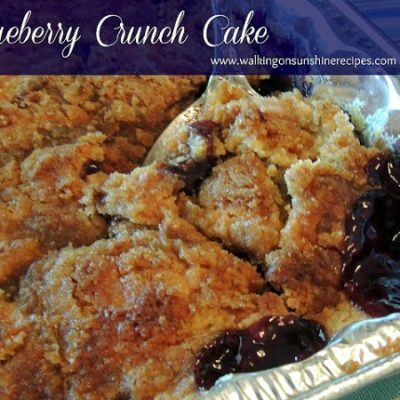 Serve this Blueberry Crunch Cake Recipe warm from the oven with a scoop of vanilla ice cream or homemade whipped cream. Your family is going to love it! 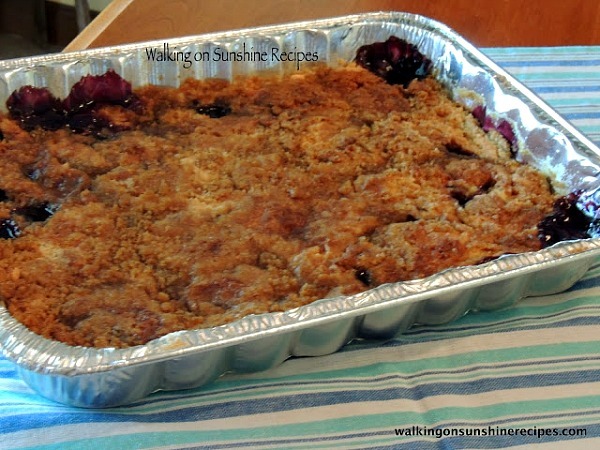 Begin by emptying the blueberry pie filling, JUICE also, into a 13 X 9 baking dish that has been sprayed with a non-stick spray. Add the can of crushed pineapple and mix with the blueberry pie filling. Sprinkle the cake mix on top. Add the butter that has been cut into pieces. Add the brown sugar, followed by the chopped pecans. Bake at 350 for 40 minutes. Peach Crunch Cake – also uses a cake mix! I agree! I love blueberries! Thanks for visiting! I love blueberries too. This looks delicious. I am soooo drooling all over my keyboard, LOL. YUM!!! Thanks for sharing at Simple Supper Tuesday. Lois, this sounds so delicious! Thank you so much for joining us and sharing at Best of the Weekend! Pinning! Hope you are having a wonderful weekend! This looks so delicious! I love how plentiful the blueberry filling looks around the inside of the pan. The crust also looks so yummy! Stopping by from "Best of the Weekend" link up. Following you on Twitter and Facebook. Your Blueberry Crunch Cake looks so good, I could just reach through this screen and have a big bite! Hope you are having a great weekend and thank you so much for sharing with Full Plate Thursday. Just pinned and will be sharing on Facebook as one of this weeks features from Freedom Fridays!! PS I so totally want this for my breakfast this morning! !